While visiting our Bulldog photo galleries you will see why Bulldogs are one of the most photographed dogs in the world. Their sweet and expressive faces make them one of the preferred dog models for photographers, amateurs and professionals alike. If you enjoy taking nice bulldog photos yourself or just would like to start now, you might want to visit our page with dog photography tips on how to best photograph your doggie companion or other people's dogs. Of course, all photos for the other galleries are still welcome ! For a complete list of our photo galleries, see our bulldog gallery homepage. Also have a look at our dog costumes page or just dress up your dog and take some pictures. 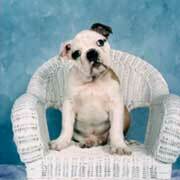 We also have compiled a selection of cute bulldog posters and prints for you. You may also like to see our page with inspirational and motivational posters.